This week I was invited to read at Yellow Door in Montréal. The evening was part of the regular series offered by founder/producer/host Ilona Martonfi who has a particular knack for organizing stimulating and diverse programs that include poetry, spoken word, fiction, non-fiction, music of all kinds, comedy and some performance art. 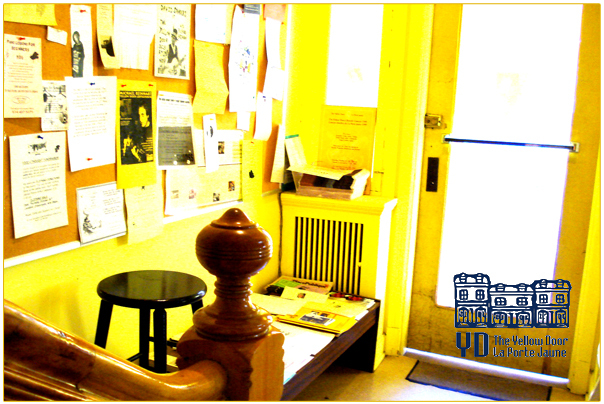 The Yellow Door Coffeehouse is the longest-run coffeehouse in Canada and the lovely old house in the McGill ghetto is home to a large number of community services and projects, in relationship with McGill University. Thumping down the wooden steps into the basement where the readings are held, one arrives in a fairly narrow but long room full of a motley collection of chairs and benches. It might not be the last word in elegance, in fact it’s more than a little scruffy, but it more than makes up for that with shovel-loads of atmosphere. There’s no coffee, latte or otherwise, as the café is closed during readings, but that doesn’t seem to matter to either performers or patrons. Presenters’ publications are arranged on the piano, and the space is full of the sound of people greeting each other, and various instruments being tuned or ‘warmed up’ (on Tuesday these were violin, harmonium and tabla drums). Yellow Door is what one might call an intimate setting: There’s probably a maximum of twenty-four inches between reader and the knees of the audience in the first row. I always feel I’m breathing in rarified air down in this basement. Mention Yellow Door to most long-time Montréal residents and their eyes will light up. Oh, they’ll say, that’s where I first heard Leonard Cohen, or: didn’t Margaret Atwood read there years ago? Joni Mitchell, Gordon Lightfoot and Jessie Winchester also performed at Yellow Door. As I listen to Somali-Canadian poet Mohamud Siad Togane’s long and hilarious poem about the dangers of flies and the unexpected antidote to said dangers, and then to Tagore songs played and sung by Shaheen Munir and Niraj Barua, I am aware that Ilona Martonfi is keeping alive a very old Montréal tradition. 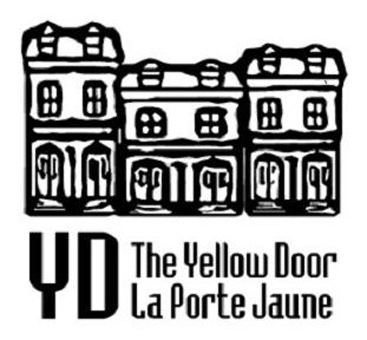 Here at the Yellow Door, she is providing a venue where Montréal artists can continue to share their visions and support and encourage each other. As a Québec anglo (English-language) writer I very much appreciate this opportunity to read my work. It’s always an honor to be included among those who present there. This entry was posted in Blog, writing life and tagged fiction readings in Montreal, Ilona Martonfi, poetry readings in Montreal, Yellow Door readings by Susi Lovell. Bookmark the permalink. Ilona and the Yellow Door — Montreal treasures.